Relativity Applies to Software Installation? Its been “less than a minute” for the past ten minutes! Come on, man!!!! These are Astronaut Eugene Cernan’s spacesuit accessories. Gene Cernan left the last human footprints on the moon in December 1972 (Apollo 17). If you look closely, you can see the lunar dust that still coats these boots. For a moment, there was only 6 inches of plexiglass separating me from articles that left this planet and set foot on the moon. Wow! 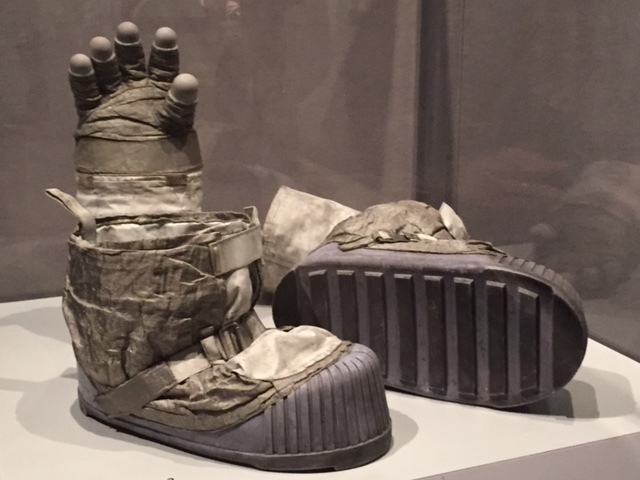 Now I saw a pair of boots that made the last human footprints on the lunar surface. This moment made me think: from now on I will use the word “impossible” with greater care. 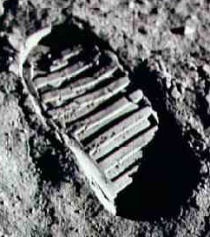 At one time a footprint on the moon was considered impossible. With the power of science and human ingenuity, we can make the impossible possible. Things don’t seem to be going well for me this week; can’t seem to kick the endless meeting streak. Projects delayed and problems reared their ugly heads; customer ripped my report to shreds. Corporate bureaucracies wore me to a nub; my presentation was an utter flub. No, I did not seem to get much done today; things came apart long before mid-day. Yes, today was the day that tested my mettle; and I’ve endured many a nasty nettle; but I will not give in, nor sway, nor settle… For tomorrow I will get back upon the saddle. I choose to try again. Spring got off to a great start today. We were 72 and sunny. To my friends back East who endured the most miserable winter in recent memory, this stuff is wending its way to you… hang in there. 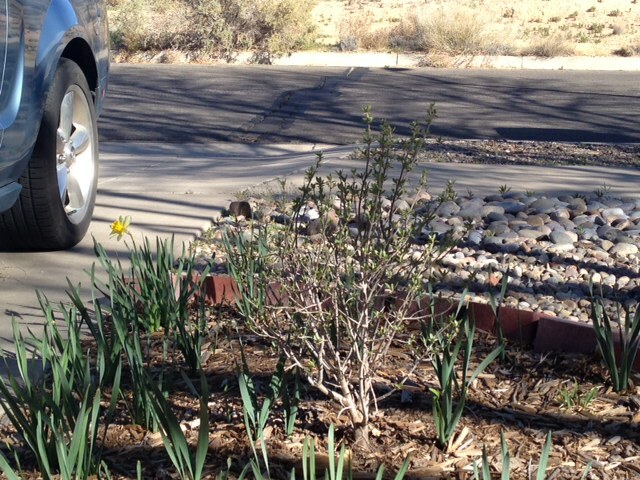 The tree in the above photo is a Russian olive tree. I don’t recall why we decided to get a Russian olive tree — I mean I love olives and I always wanted an olive tree but the Russian olive tree produces no olives. I have no idea what purpose a Russian olive tree serves. Well, I don’t care what it does as long as it doesn’t annex my house or my Mustang. There will be sanctions if it does. … were the first words out of my mouth when the USA Today notification flashed upon my iPhone screen alerting me to a “shooting at a Maryland mall.” I used to frequent the Mall in Columbia when I lived in the area. I still have many friends that live nearby and I hoped none of them got caught up in the melee. All are ok as far as I know. I occasionally still visit while on travel for work. I sometimes swing by the Columbia mall to get my Teavana fix. Until recently Albuquerque didn’t have a store. There is a deli in the food court that makes the best potato salad and hand-made sandwiches; there is also a good sushi restaurant across from the mall that I still frequent (the name of it escapes me at the moment). As you can see, I have a lot of fond memories of my time at the Columbia mall. Not once did the thought or feeling ever occur to me, that some one could be packing and decide to whip it out causing chaos and harm. The only annoyance I ever encountered was having to dodge the rows of cell phone and cell phone accessory kiosks. Being hounded to show my phone, my service plan, promising they could give me a better contract, or giving me “a special 10% discount” if I showed my employers special access badge. That is the only horror anyone should have to endure at any mall. Well, the cell phone kiosk thing, and dodging packs of hyper-texting pre-teen girls who apparently just discovered makeup and decided to apply all of it in one application. Make Your Own Motivational/Demotivational Posters.